A photograph of the USS Sable in the 1940's. Click image for larger view. 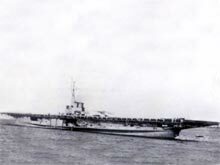 In August 1942, the U.S. Navy commissioned USS Wolverine as its first in-land aircraft carrier. The Navy added USS Sable a year later. Both were originally luxurious passenger steamers, but after conversion they became the only side-wheel propelled carriers in the U.S. Navy, and possibly the world. 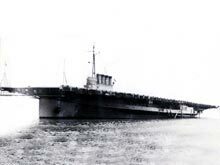 The majority of carrier qualifications during World War II occurred from the decks of Sable and Wolverine, and a large number of landing signal officers and ground crew learned their trades on its decks as well. Wolverine launched its first aircraft on August 25, 1942 and served as a training platform until November 11, 1945 when both vessels were decommissioned. Sable qualified its first two pilots on May 2, 1943. On October 21, 1942, the pilot of an F4F-3 Wildcat spun into the water after takeoff from Wolverine. The plane sank with the pilot into 85 feet of water, and neither his body nor the plane was ever recovered. This was the first of many accidents to occur on board these ships. A photograph of the USS Wolverine in the 1940's. Click image for larger view. Because these were training vessels, losses from the decks were expected. Between 1942 and 1945, the years of the carriers operations, there were 122 losses and over 200 separate deck accidents. Although the majority of losses resulted in only minor injuries, eight pilots were killed. Approximately 120,000 successful landings took place, and an estimated 17,000 pilots qualified, including former U.S. President George H.W. Bush. This aircraft assemblage is the only collection of historic, World War II, Navy, aircraft preserved in cold, fresh water. 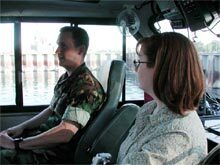 On May 29, 2004, a U.S. Navy Explosive Ordnance Disposal (EOD) Area Search Detachment team, under the guidance of Wendy M. Coble, an underwater archaeologist from the Naval Historical Center (NHC), began a week-long remote sensing survey of the southern portion of Lake Michigan looking for these sunken historic World War II vintage aircraft. The project was funded by a small grant from the National Oceanic and Atmospheric Administrations Office of Ocean Exploration (NOAA-OE). The NHCs Underwater Archaeology Branch has management responsibility for the Navys historic ship and aircraft wrecks. The aircraft wrecks lost in Lake Michigan have long held Navy interest and this survey is the Centers first opportunity to search for the wrecks. The information will be included in a management plan of the entire assemblage of wrecks in Lake Michigan. The U.S. Navy EOD Mobile Unit TEN is stationed in Fort Story, Virginia. The crew who assisted in this survey was comprised of active and reserves sailors. The NHC is proud to have the assistance of this unit, and is happy to provide them with an opportunity for further training. The EOD Area Search Detachment's primary mission is to operate side scan sonar systems capable of locating objects underwater. They are capable of precise navigation and can locate mine-like contacts for further prosecution by EOD or Ordnance Clearance Detachments. By assisting with this survey, the team gains valuable experience in locating submerged objects. 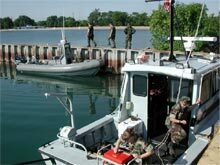 EOD MU 10, prepare their boats and equipment for another day of survey. Click image for larger view. ET 1 Dominic Fecteau explains the project to a teacher from the Woodstock, Illinois Girls Take Off program. Click image for larger view. As an education outreach of this project, the NHC has partnered with the Woodstock Community School Districts Girls Take Off program. This program encourages interest in science and math for middle school girls by introducing them to women with careers that use math and science. Coble has introduced the girls to the science of underwater archaeology and remote sensing through various exercises and informational projects. In addition, the girls were able to meet Coble and the EOD team during the survey to tour the boats, see the equipment, and discuss the work with the entire team. The visit made a large impact on the girls and their teachers and the contact will probably continue during their upcoming school year. The survey successfully searched six of the ten planned search areas. The sonar images are still being analyzed, but preliminary analysis indicates that several planes were located. Future plans may include further survey of important targets.